Our advice and support is free and strictly confidential. Experienced practitioners and other professionals across Queensland are ready to help and support you. 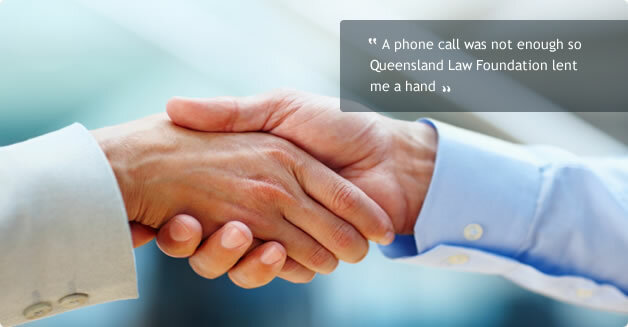 The Helping Hand service provided by Queensland Law Foundation (the Foundation) opened on 1st August, 2008, and co-exists with the Solicitor Assist Hotline service. At times, a QLS member practitioner may find he/she needs more help than just a phone call and that, in fact, he/she needs the assistance and support of an experienced legal or other professional in his/her office to assist with a particular problem. The Foundation may also provide assistance in areas concerning more personal problems eg. depression, alcohol/drug dependency, gambling etc. The advice and assistance given is free and no fees are payable by the member. 100% solicitor/client confidentiality is assured. Information was received by one of our Board members that a particular regional practitioner was having difficulties keeping up with his work load and consequently, matters were being left unattended and problems were beginning to escalate. The Foundation arranged, at no cost to the practitioner, for one of its panel members to attend at his office for 3 days, until control of the situation was regained. That practitioner has since continued under his own steam, and no further calls for assistance have been received. If you need a hand please go directly to our Secretary or contact one of our Hotline operators. Information was received by the Secretary that a sole practitioner had had an accident, that he had been hospitalised with no one to look after the practice. The Foundation arranged for one of its panel members to attend at the practice until more permanent arrangements could be made to have a qualified practitioner keep the practice open until the return of the owner. Information was received of a regional sole practitioner who had become “paralysed by stress” and that certain matters were requiring urgent attention. The Foundation supplied a panel member to attend at the office of the practitioner to work through the files, and also arranged and paid for Counselling for the practitioner to provide a long lasting form of assistance.